Kayaking along the coast for San Juan Island has been bringing visitors to the islands for many years. More to the point most everyone one comes to paddle along the western shore of San Juan. The west side of San Juan Island identifies with a rugged rocky coast, mountain views, and most popular, the main travel corridor for marine wildlife. The Full Day Kayak Tour is a classic paddle from San Juan County Park to Deadman Bay just to the south of Lime Kiln State Park. Over the years this route still remains the most popular among visitors to San Juan Island. Along with all this popularity comes a bit of impact. Our beach destination at Deadman Bay sees a lot of visitors from kayak and those who hike in. The land we use at Deadman Bay is owned by San Juan Island Landbank that allow us to use the beach for our commercial kayak tour operations. The Landbank monitors the many potential impacts to all this visitations and shares the information will all the kayak operators using the beach. Over time it was apparent there were a few things commercial kayak companies could improve on when landing at Deadman Bay. The first improvement was simply to reduce the visual impact to other visiting the beach. The old days of landing where ever we wanted and spaced across the whole beach. We consolidate our landings to an area that is less visible to those visiting from shore. This was probably the easiest adjustment in my opinion. Next, the steep access from the beach to the upper land area was seeing an increase in erosion. The Landbank as done significant work to reduce the impact of erosion form all the foot traffic along the steep path to the upper land area. The upper area is where the restroom is located so almost all visitors from kayak tours will access this path. Just to the north side of the beach, the rocky area has tidepools. These tide pools have seen a lot of explores sneaking along the rocks to see who is living there. Over time with many people walking along the tidepools, there is an evident impact on these communities. The above are just a few of the factors that made us rethink how we wanted to use the beach and impact the shore at Deadman Bay. After much thought, we decided it was best to reduce our landings at Deadman Bay. We achieved this my voluntarily taking on my one Full Day Kayak Tour a day to the beach. These kayak tours have a maximum capacity of 8 guests. It is always a tough decision when choosing to reduce your business capacity but looking at increased beach use we felt it was the best thing to do. We had hoped many of the other companies would have followed but unfortunately, this was not the case. Some operators will take groups of 16 to 30 to the beach. So today we still stick to our standards and only offer one Full Day Kayak Tour a day. This does mean the tour will sell out and we may lose business for this who cannot schedule for another day. We offer an amazing Half Day Kayak Tour that travels the same route, we just omit the beach stop. This option works out great for the majority of travelers that want to make time for other activities. But for those that are looking for the best Full Day Kayak Tour experience on San Juan Island. We recommend reserve with Discovery early. Reserve knowing we are doing everything we can to reduce our impact to the shoreline of San Juan Island and that you will always be paddling with a small group. 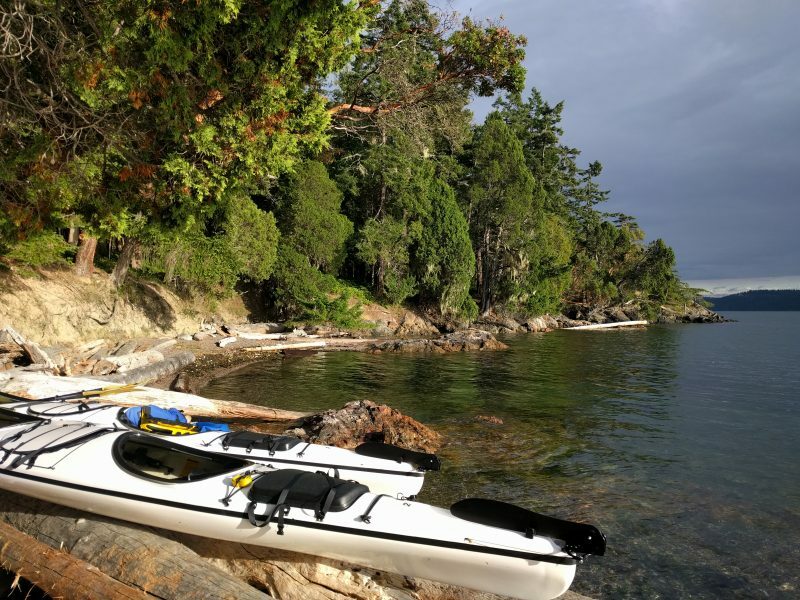 Kayak the San Juan Islands with Discovery Sea Kayaks and tread lightly as you enjoy the islands.